They are experts in several fields in the technology sector, providing a range of products including interactive touchscreens, visualisers, response systems and software. Their equipment is used to improve teaching, training and presentations within the education, hospitality, corporate and health industries. Central to the Genee range of products are durable, high-quality touchscreens up to 84” and 4K super HD. All screens offer up to ten touch-points and can detect touch from any object. All sizes have the option of an integrated PC. 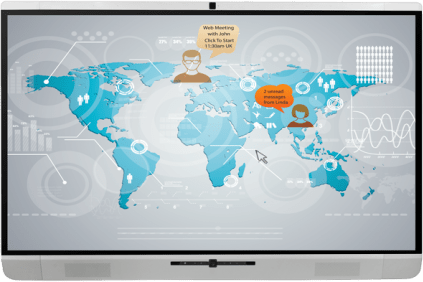 Interactive whiteboards enable you to deliver interactive presentations which engage your audience. Genee Powerboard is part of Genee World’s high-spec interactive whiteboard range, it shares the screen of your device and uses infrared technology to detect touch from any object. Multiple users can interact with the screen simultaneously thanks to its sophisticated multiple touch-point technology. Using the 20 programmable quick keys, you can open your favourite applications at a single touch. A specially coated durable porcelain surface offers minimal glare and easy cleaning, whilst notes and annotations can be converted to text and saved. Why not speak to our Audio Visual team and they will help you select the Genee product best suited to your needs.